05/10/12 No Plastic Bag should be Free, Because None of Them Really are! Although our grandparents used only a few long-lasting bags in their lives, managing to do their shopping with them without a problem, today masses of plastic bags, which are extremely harmful to the environment, are relentlessly used every day. The decision of the Ministry of Environmental and Nature Protection to introduce obligatory charge of plastic bags, through a rulebook concerning the new Waste Act, is on track of modern European and world wide initiatives for environmental protection. Last year EU Commissioner for Environment Janez Potocnik stated that the possibility of introducing a ban on plastic bags in all EU countries was being considered, as well as other options - additional tax on plastic bags or a legal obligation to charge shoppers for plastic bags. Also, our neighbor, Italy, has been offering only biodegradable bags made of cotton or paper to shoppers since last year. Ireland was the first in Europe to introduce a tax on plastic bags in 2002, and their usage has decreased by 90 per cent to this day. China, Israel, Canada, South Africa, Australia, and the cities of San Francisco, Los Angeles, Mumbai and others, have banned the use of plastic bags or will do so in the near future. South Africa, Ireland, Taiwan, Bangladesh, Bhutan, Rwanda and Zanzibar are examples of countries which introduced fines for those who use those non-ecological bags. Natural resources and energy are used to produce plastic bags, and later they contribute to accumulating waste, suffocate animals in seas and pollute beaches. As a tourist country, Croatia should learn not to destroy its own natural beauties and clean nature with plastic bags on the example of other countries which have introduced a ban on plastic bags due to pollution. Therefore this decision by the Ministry of Environmental and Nature Protection protects Croatia, and citizens are educated to buy and use things which will last longer, and to use bags multiple times, instead of only once. In favor of the importance of the ban on plastic bags are shocking facts. Every year 500 billion plastic bags are used across the globe, less than 1 per cent of which are recycled, due to high expenses. The other 99 per cent end up in the nature (seas, oceans, rivers and lakes) where they kill hundreds of thousands of sea animals and birds who mistake them for food, causing them a slow and painful death. It is estimated that 4 million tons of plastic are floating in the oceans, which makes 10 per cent of total sea waste! Only in 2008, 3.4 million tons of plastic bags were produced in Europe, which is equal to the weight of about 2 million cars. If only one in five citizens of Croatia stopped using plastic bags, the next generation would find 199,588,499,000 plastic bags less! Only one cotton bag replaces up to 1,000 plastic bags, and a man can save more than 22,000 plastic bags by choosing the ecological alternative. Plastic bags cause great ecological problems since it takes them decades to disintegrate into smaller pieces, and eventually they disintegrate to plastic dust, which is extremely undesirable in environment because it contaminates ecosystems and ends up in our food and water. Another alarming fact is that just the toxic smoke which is made when plastic is burned kills hundreds of people every year, and plastic in the fields prevents the passage of oxygen and causes infertility of the soil. Less plastic bags would also mean less addiction to oil, because plastic bags are made of polyethylene, a thermoplastic made by processing oil. Many countries have started to work actively on solving the problem of plastic bags. Animal Friends has warned about the enormous ecological harm and animal casualties which are the consequence of mass usage of plastic bags. Through frequent campaigns they educate the public on environmental protection by distributing leaflets and free cotton bags. "Bag Monster," a plastic monster, explains the consequences of non-ecological bags to children in an easy to understand and fun way, and the installation "Oceans then and now" points out the drastic changes in the appearance of the oceans and their extinction. A petition for the ban of plastic bags has been initiated, a ban which would save hundreds of thousands of animals, save natural resources and preserve ecosystems. Animal Friends calls upon citizens to reject plastic bags and replace them with long-lasting, ecological and practical bags, which can be used multiple times, and which contribute to creating a cleaner world, without violence towards animals and nature. An article on the hamfulness of plastic bags to animals. The leaflet on plastic bags can be seen here. Launching of the petition to ban plastic bags. The campaign was started on June 13, 2008, by submitting an official proposal to ban selling of plastic bags, and our first press release on that issue was on June 15, 2008. The petition to ban plastic bags was started in collaboration with other organizations on September 16, 2008, and it has been signed since then on our info stalls, festivals, other organizations and on our web site. The petition was presented at the first ZeGeVege Festival, on September 20, 2008: www.prijatelji-zivotinja.hr/index.en.php?id=987, www.prijatelji-zivotinja.hr/index.en.php?id=985 where a tree with hanging plastic bags was installed. The tree was planted later and today it grows at Lake Bundek. The campaign and the petition was continued with Plastic Monsters, which had their first action on December 19, 2008, and which are still regularly used to collect signatures for the petition against plastic bags. We continued to collect signatures and campaign, and invitedchain stores to cooperation. On January 30, 2009, we succeeded to come to an agreement with one of them to stop distributing plastic bags for free. The campaign is run in other cities and towns. 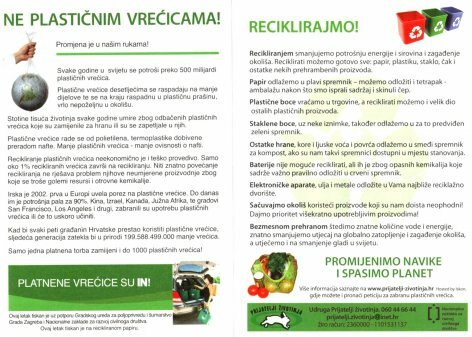 On April 17, 2009, we handed out a number of cotton bags with the organization Vigea, and we printed a large number of leaflets against plastic bags which we distribute. On April 24, 2009, we submitted the signatures for the first time, when we submitted more than 27,000 signatures to the Ministry of Environmental Protection, and continued to collect signatures at festivals and info stalls in 2009, 2010, 2011 and this year. We estimate that the yearly usage of plastic bags in Croatia is very high, considering that in almost every store plastic bags are free and citizens take and use them without consideration.